Life is not a bed of roses. There is no such thing as happiness without pain. So when you're bothered by the annoying "iMovie won't import MP4 files" problem, why not think in this way? It's just the other side of your life. Take it easy to solve this issue. After pain, there should be laughter. Of course, you can get assistance here if this is too tricky for you alone to resolve it. We'll feel very glad if this article can help you successfully import MP4 files into iMovie. Before fixing the problem, you'd better know the reasons why you fail to add MP4 to iMovie. Thus, you can clearly judge which antidote can cure your disease. Reason 1: your MP4 file is so damaged or corrupted that iMovie can't read the broken data in MP4 file. Reason 2: MP4 format is one of the best iMovie video formats. Well, bear in mind that iMovie only accepts MP4 files encoded by H264/MPEG-4 and AAC codecs. However, MP4, as a container format, is encoded by dozens of codecs, not only H264/MPEG-4, but also HEVC/H265, MEPG-2 Part 2, AVC, H263, etc. See, the common reasons are the damaged MP4 file and MP4 codec problem. No matter which one your MP4 is, you can easily solve it using the below solution. MacX Video Converter Free (for macOS/Windows PC), a professional MP4 to iMovie converter freeware, is able to auto repair damaged MP4 files to regain MP4 broken data and free convert MP4 videos to iMovie supported MP4 format with H264/MPEG-4, AAC codecs. 1. With 320+ video and 50+ audio codecs supported, you're allowed to free convert any video on macOS and Windows. Free convert MP4 to iMovie MP4 or MOV format with H264/MPEG-4 and AAC codecs, as well as convert strange MP4 files to iMovie supported DV, AVCHD, MPEG-2, etc. 2. Any video converter is essentially useless if it produces the video with poor quality. This is considered by this thoughtful software, with High Quality Engine internally installed to guarantee output video quality up to 98% reserved, no visual quality loss. 3. User demand diversity is the main stream. It also let you free convert MP4 to iTunes, MP4 to MOV, MKV to MP4, YouTube to MP3, etc. 200+ formats. 4. A broad selection of video editing tools are available, such as trim, crop, add subtitles to MP4, rotate MP4, merge MP4 videos, adjust parameters, etc. Drag-and-drop MP4 video file or click "Add Video" button to import MP4 files after you Free download the freeware on macOS (or Windows version) and fire it up on your computer. Click "to iMovie" under "Apple Device" profile and select "iMovie (H264)" or "iMovie (MEPG-4)" as output video format. Providing output video quality is your top concern, you can adjust video parameter settings, including Bit rate, frame rate and resolution to improve output MP4 quality. Turn up bit rate around 20-50%, change video frame rate from 23.97fps to 30fps/60fps, etc. and adjust video resolution from 720p to 1080p/2160p. Another option is to use the slidebar to adjust video quality from LQ to HQ. Of course, this will slow down the conversion speed, to some extent. Click "Browse" button to choose the location where you save converted iMovie MP4 file on your MacBook, iMac, Mac Mini, Mac Pro or Windows. Tap "RUN" and this free tool will begin to convert MP4 to iMovie (H264/MPEG-4) on macOS/Windows. 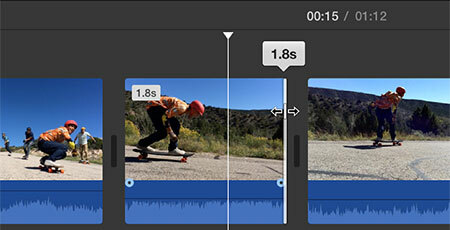 After the jos is done, you can import MP4 into iMovie for later MP4 video editing. What if you wanna directly download YouTube MP4 video to iPhone iPad or record non-downloadable video for offline watching? Resort to its advanced version MacX Video Converter Pro, which covers all the features you need, including free downloading video from YouTube, FB, etc. 300+ sites, record on-screen video, download video to iPhone X/8/Plus/7/6s/6, make photo slideshow video, edit MP4 video (trim, crop, add subtitles, rotate, merge, etc.) and more. After the unusual MP4 conversion is finished, the next step is to import MP4 to iMovie for editing. If you have an adequate experience with this Apple MP4 video editor, you can skip this part. On the contrary, if you're new to iMovie, you're recommened to spend 1 min on this iMovie tutorial to learn how to use iMovie to edit MP4 video on macOS. In case you're familiar with Photoshop, you know what layer means. 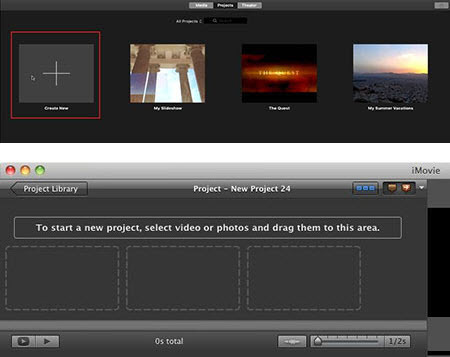 In iMovie, Project is similar to layer in Photoshop. Thus, prior to import MP4 into iMovie, create a new project first. Click "Create New" icon to create one project. To add MP4 into iMovie, here are three ways to go. ● Tap "Import" button at the top of the interface to import MP4 to iMovie. ● Drag and drop MP4 files to the area as the right picture shows. ● Browse inside your own personal library via "My Media" to import MP4 files into iMovie. Honestly speaking, iMovie is badly complicated, especially to the newbie. If you don't follow the iMovie manual, you would feel confused and disoriented. What's more, iMovie has dozens of editing tools. You don't even understand what they stand for if you don't try it yourself. So after you read the below iMovie editing features introduction, you'd better open your iMovie on macOS or iOS to have a try. Crop MP4: with iMovie, you can crop MP4 video file to remove unwanted blank borders off MP4 to compress MP4 file and adjust MP4 video frame rate. Step 1: Tap the "Crop" button and then click a clip to select it. 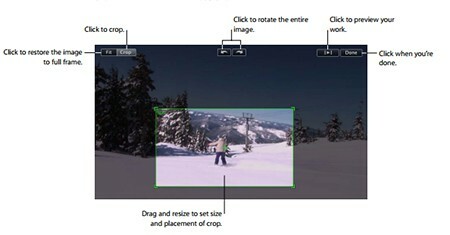 Step 2: Click "Crop" in the viewer and a marquee with green lines appears in the viewer to allow you to freely crop MP4 video image. Step 3: Hit "Play" icon to preview your edited MP4 video. Step 4: Press "Done" if you're satisfied with your work. Trim MP4: iMovie's trim feature is widely used for users to shrink MP4 video duration, especially when you plan to transfer MP4 to iPhone (16/32GB) for on-the-go playback. It helps you losslessly cut off the unwanted parts from MP4 video like the meaningless prelude or ending. 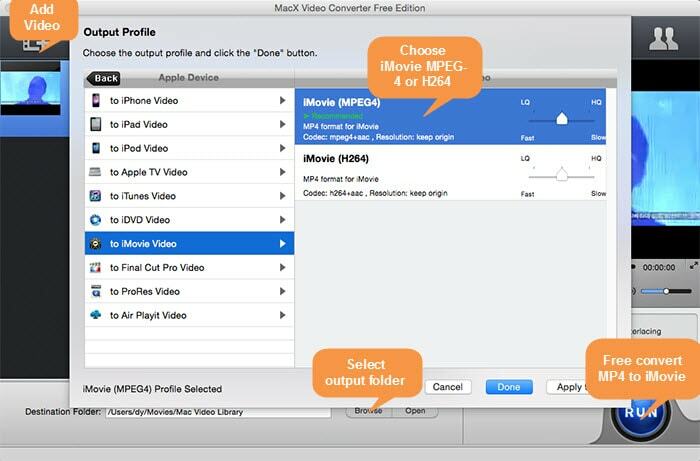 Follow the steps to trim your MP4 files in iMovie. Step 1: Choose a MP4 video clip in your project. Step 2: Click "Edit" > "Trim" or tap the "Clip Duration" button in the corner at the beginning of the MP4 clip. Step 3: Control the left/right arrow to set the start and end time of your MP4 video clip. Step 4: Tap "Play" in the trimmer to preview the change. Then press "Done". Step 1: Tap the "Music and Sound Effects" button in the iMovie toolbar, or alternatively click Window > "Music and Sound Effects". Step 2: Open a sound effects folder to see the sound list, or utilize the search field to find an audio file by name. Step 3: Choose an audio effect file and drag it to where you want it to locate. Step 4: Adjust the audio effect file length via the green slidebar to slide from right to left. Note: iMovie contains a wide selection of video edit tools. Thus, there is no enough space to list out them all. 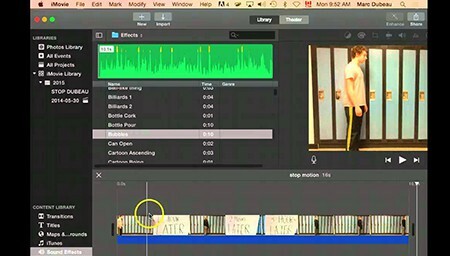 If you wanna know other iMovie video editing tools like fade in, fade out, slow motion, rewind, tag video with keywords, etc., feel free to visit iMovie manual on the official Apple website. MacX Video Converter Free (for macOS/Windows), whose primary feature is to free convert MP4 to iMovie MP4, MOV formats with H264/MPEG-4, AAC codecs, as well as free convert MP4 to iTunes, MP4 to QT, MKV to MP4, AVCHD to AVI, etc. 180+ video and 14+ audio formats.